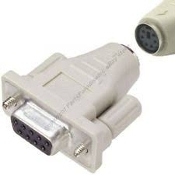 PS/2 Female to DB9 Serial Female Mouse Adapter. Our Products >> MiniDin6 PS/2 Female to DB9 Serial Female Mouse Adapter. MiniDin6 PS/2 Female to DB9 Serial Female Mouse Adapter. PS/2 Female Mini Din 6 to DB9 Serial Female Mouse Adapter. MiniDin6. New.